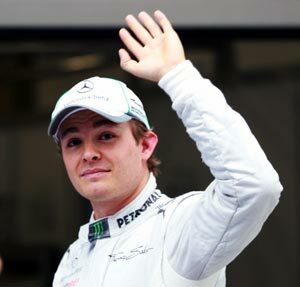 Germany's Nico Rosberg rocketed to the first pole position of his Formula One career at the Chinese Grand Prix in Shanghani, on Saturday in what will be an all-Mercedes front row with team mate Michael Schumacher alongside him. Schumacher, the seven times champion whose 91st and last win came in Shanghai with Ferrari in 2006, qualified in third place but will move up to second because McLaren's Lewis Hamilton takes a five place grid penalty for an unscheduled gearbox change. The pole was the first for Mercedes with their own team since the late Argentine Juan Manuel Fangio at the 1955 Italian Grand Prix. Mercedes left the sport that same year and, despite considerable success as an engine provider, only returned under their own name in 2010 after they bought the 2009 champions Brawn GP. "It's a great feeling, fantastic," beamed Rosberg, son of Finland's 1982 world champion Keke, whose pole came at the 111th attempt. His only previous front row appearance was in Malaysia in 2010. "For the whole team it's a special moment." The German swept to the top slot by a massive margin, with a best lap of one minute 35.121 seconds compared to Hamilton's 1:35.626. Hamilton, the 2008 champion and last year's winner in Shanghai, had been on pole in the two previous races of the season with McLaren sweeping the front row in both Australia and Malaysia. "Congratulations to Nico, it's fantastic," said Hamilton, genuinely pleased for a friend who was a team mate in the junior series in 2000. "I am very proud of him. We grew up together, racing together and always dreamed of being in Formula One." Schumacher, who holds the Formula One record of 68 career poles, also congratulated his compatriot. "I said 'well done' because that was a phenomenal lap time," said the 43-year-old. "It's a bit of a surprise but there you go. He's known as a good qualifier...I am happy for him." On a day when the focus returned to the track after a build-up dominated by talk of next week's controversial race in Bahrain, double world champion Sebastian Vettel produced another shock. The Red Bull driver qualified only 11th, his worst performance in qualifying since he became champion and lowest grid position since Brazil in 2009, 42 races ago. Sauber's Japanese driver Kamui Kobayashi will share the second row with Finland's 2007 champion Kimi Raikkonen in a Lotus. McLaren's Jenson Button and Red Bull's Mark Webber will line up together on the third row. Ferrari's championship leader Fernando Alonso starts ninth.